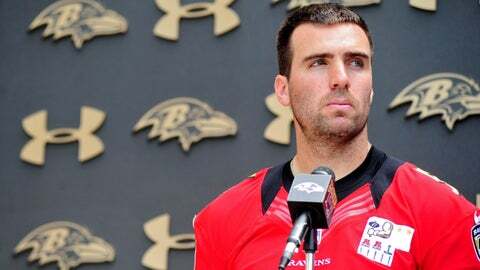 Baltimore Ravens quarterback Joe Flacco (5) is interviewed after organized team activities at the Under Armour Training Facility. OWINGS MILLS, Md. (AP) — Joe Flacco’s knee is problematic for the Ravens. With Flacco banged up, the passing game is a concern for Baltimore heading into its critical regular season finale in Cincinnati. "He’s definitely not 100 percent on that knee," Baltimore coach John Harbaugh said. "But to say how much or to what degree (he is limited) is just impossible to say. I think he fought through it. He gutted it out. He battled. "And that’s what you do this time of year. And that’s what makes Joe who he is. He’s a tough, hard-nosed competitor. So we appreciate that about him." Flacco sprained the medial collateral ligament in his left knee against the Detroit Lions Dec. 16. The quarterback said later the injury wasn’t a factor during the Ravens’ 41-7 loss to New England last Sunday, but he finished just 22 of 38 for 260 yards with no touchdowns and two interceptions. Flacco did play better in the second half against the Patriots. He was just 5 of 10 for 52 yards with an interception in the first half, but he was 17 of 28 for 208 yards in the second half, although he did throw another interception. He said the first half struggles had nothing to do with the knee, though. "It felt really good on game day," Flacco said Tuesday. "It was a little sore yesterday and today, but it feels a lot better." However, the problem wasn’t just Flacco. Top wide receiver Torrey Smith was held without a catch during the first half. New England took away tight end Dennis Pitta. Wide receivers Jacoby Jones and Marlon Brown also both struggled to get open. The Ravens have struggled to run the ball all year. Their average of 3.1 yards per carry is the worst in the NFL. But the struggles of the passing game contributed to Baltimore picking up just 71 yards and five first downs during the first half against the Patriots. The passing game was struggling some even before Flacco got hurt, though. Flacco was just 20 of 38 for 222 yards during the game he got injured despite facing a Lions pass defense that was ranked among the worst in the league and was without its two starting cornerbacks. The Ravens have scored just one touchdown in their last eight quarters of play, and they will now, with their season on the line, face a Bengals defense that is ranked sixth-best in the NFL against both the run and the pass. "We’re used to these guys," Flacco said. "They’re a good defense. They have been for a few years now. It’s always a good test to play a division opponent in their place. They have a lot to play for. We have a lot to play for. It’s going to be a good game, a good test."